From corporate giants to new-age ventures in attendance, IIT Bombay’s E-Summit was a potpourri of events that comprised a job fair, a start-up expo, competitions, workshops and sessions with prominent speakers, investors, industrialists and professionals. Organised by the premier organisation’s E-Cell, the two-day event saw speeches from Infosys co-founder and Axilor Ventures chairman Kris Gopalakrishnan, Raymond Group chairman Gautam Singhania, Tata Motors’s Global CEO Guenter Butschek, Indian American venture capitalist Gururaj Deshpande, Pidilite Industries chairman Madhukar Parekh, Inox CEO Alok Tandon, Expedia group vice president Subbu Allamaraju, The Walt Disney Company’s India head Abhishek Maheshwari, Nvidia India head Vishal Dhupar, among others. The Ten Minute Million, a competition where start-ups got ten minutes to pitch their ideas to a panel of investors, was a huge success. Three out of eight start-ups got funded, with CrossForge Solutions raising Rs 147 lakh, rePurpose Solution bagging Rs 101 lakh and Giscle System Rs 63 lakh. Eureka!, Asia’s largest business-model competition, got its winners for 2019. The five-month-long competition saw Eco, a friendly water retention natural polymer start-up, winning Rs 5 lakh in business track followed by FoodCoWorks bagging Rs 3 lakh. Augle, an artificial intelligence (AI) start-up from IIT Bombay, won Rs 1 lakh. Social tracks winners were Greenwrap (Rs 3 lakh), Pure Paani (Rs 2 lakh). Another event, Internship and Job Fair (IJF), provided a platform for the companies to hire India’s best talent for different profiles, and a platform for students to get an internship or a placement in these companies. Property Monk, a start-up firm, had over 12 walk-ins within an hour while Moneytap had more than 25 walk-ins and six online registrations. Nvidia’s Dhupar said. “Artificial Intelligence is the eyes of the companies.” He spoke at length about entrepreneurship is driving revolutionary change in AI. 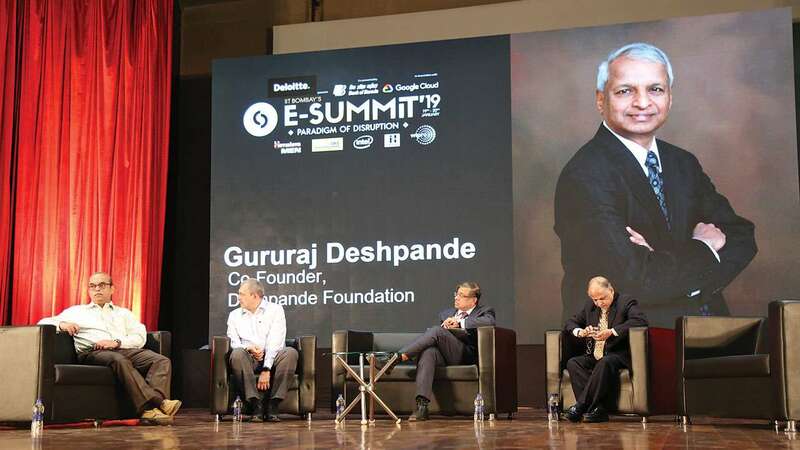 Gururaj Deshpande, co-founder of Deshpande Foundation, spoke at length about why India needs more entrepreneurs. He further proposed a new way of learning – to look for problems and then learn everything needed to solve them. He concluded his talk by saying that “big vision” and “small steps” are a great way to build companies. “We should always try to pioneer segments”, said Parekh of Pidilite. He talked about how important it is to have intellectual humility to be a successful entrepreneur and that we should always be aware that there are many things to learn out of which we know only about a fraction. Allamaraju of Expedia group spoke about leading ways through ambiguity. He quoted, “Ambiguous problems are boundary-less and the only way to face them is to find a solution yourself”. Rajen Vagadia, vice president and president Qualcomm India and SAARC, Till Faida, co-founder and CEO of EYEO (Adblock Plus), Shimon Schocken, a computer science professor at IDC Herzliya and Deepak Kankaraju, a digital marketing blogger, were also among speakers.